The cidermaker’s year, like the school year starts in September when the harvest gets under way in earnest and the business of cider can begin. Picking apples in any quantity isn’t easy, especially in old-style orchards where climbing to the tops of the tree with a basket is required! The other alternative of waiting for the wind to do its work would be a long and unpredictable business, although windfalls can be and are collected for cidermaking. Traditionally the apples would be gathered in heaps to mature and soften for a few days. They would be taken to the mill where they would be floated in troughs or even streams to wash away any leaves, twigs and insects, and to allow the apples to be inspected so that rotten fruit could be discarded. More modern orchards, which can support 250 trees to the acre compared to the standards orchards 40, are harvested mechanically. They are planted in rows that are wide enough to allow machinery that clamps the trunks and then vibrates rather than shakes them, as shaking loosens the roots and damages the trees. The first machine is followed by a blower that drives tha fallen fruit from under the trees into the central lane, where its picked up by a third machine which flips the apples into collecting bags. Cidermaking starts later these days than it used to – in old days early cropping sweet varieties were picked and pressed in summer to make a light cider that would be ready for christmas. Nowadays, the harvesting, milling and pressing takes place from mid-September to mid-November. Winter is a time where the cidermaker has to be patient. The apples are all pressed and in their fermenters. So there’s nothing to do, but leave the yeast to get on with it. However, out in the orchards there is plenty of work to be done. January and Febraury is time for pruning. 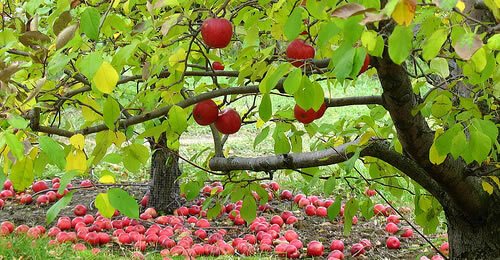 All the the apples, not just those at the top of the tree, need sunlight. They need air too, to dry them after rain, and a space to minimise the spread of mildews and moulds. Pruning is a big job, for a tidy tree is a healthy and productive tree. 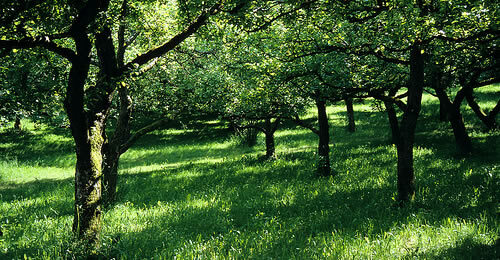 In Britain the acreage of commercial orchards fell from 150,000 in 1970 to only 50,000 in 2000. However, its on the increase now, thanks to the planting of thousands of acres of cider orchards mainly by the bigger manufacturers. By spring, the new cider should be ready for drinking. May is when the new season’s cider goes on sale at most producers. 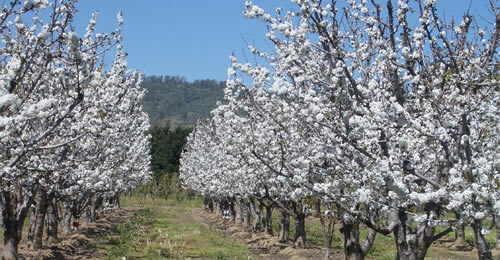 This is also blossom time, that spectacular season when the countryside bursts with pink and white flowers. Perry pear trees blossom earlier than apple trees, and it quite a sight when you visit the countryside of Herefordshire or Somerset – the main cider making regions in the UK. However, for the grower, blossom time is a time of anxiety. 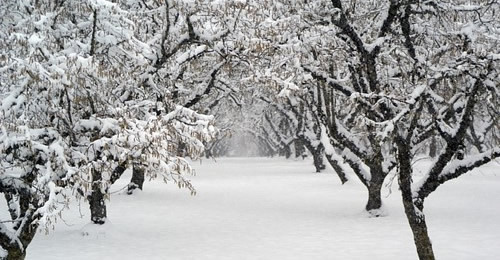 A late frost could ruin the harvest by killing the blossom, and a wet spring can stop the fruit from forming. With a warm spring, the cider maker can afford to relax a little in the summer months and watch the apples swell and ripen. However, pests thrive in summer as much as the fruit does, and some producers have to spray their fruit. In organic orchards, insecticides are based on natural plant extracts such as pyrethrum and nicotine are permitted. For owners of old fashioned orchards, those with tall trees rather than modern bush trees, there also the potential of grazing for stockbreeders. Sheep, cattle and pigs all thrive in orchards on the grass, and windfalls. They also help control the weeds and brambles that may otherwise hinder the harvest.